Oil traded near $50 a barrel in New York as traders weighed a flood of U.S. crude exports against the possibility of extended production cuts by OPEC and Russia. Futures were little changed after settling at a two-week low on Wednesday. Overseas shipments from the U.S. jumped to a record last week as production rose, government data showed. In Russia, President Vladimir Putin said he’s open to prolonging a deal with OPEC to curb supplies, though a decision won’t be made until the current agreement nears expiry in March. Saudi King Salman bin Abdulaziz began a four-day visit to the nation on Wednesday. Though a rally in September helped propel oil into a bull market, prices have slipped back amid concern the market remains oversupplied despite cutbacks by the Organization of Petroleum Exporting Countries and its allies including Russia. A possible extension of the deal “should be at least until the end of 2018,” Putin said in Moscow. West Texas Intermediate for November delivery fell 4 cents to $49.94 a barrel as of 12:55 p.m. London time. Total volume traded was about 35 percent below the 100-day average. Prices fell 44 cents, or 0.9 percent, to $49.98 on Wednesday. Brent for December settlement gained 24 cents to $56.04 a barrel on the London-based ICE Futures Europe exchange, after declining 20 cents on Wednesday. The global benchmark crude traded at a premium of $5.74 to December WTI. 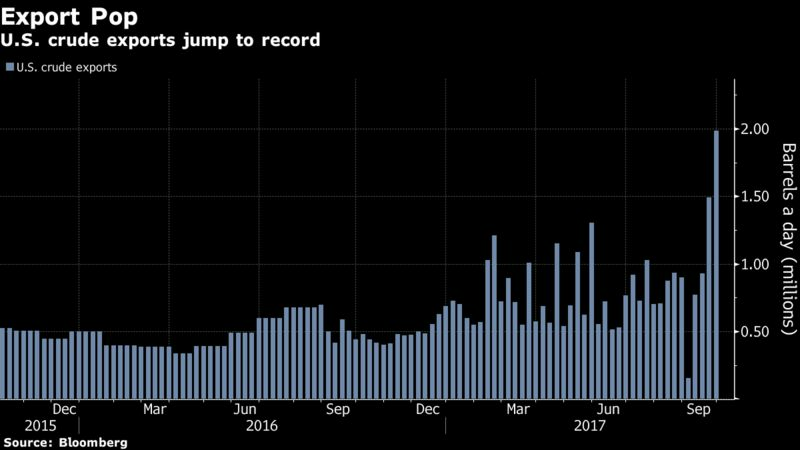 Lower demand from U.S. Gulf Coast refiners that are still recovering from Hurricane Harvey in August has caused crude sellers to seek markets abroad, triggering shipments of 1.98 million barrels a day, the highest level in weekly government data compiled since 1993. The figure was about a third higher than the previous record, set the prior week. Traders are again bracing as a tropical depression that could grow into a hurricane is forecast to strike the Gulf Coast late Sunday, potentially forcing offshore oil and natural-gas rigs to shut. King Salman of Saudi Arabia, OPEC’s biggest producer, is due to meet Putin on Thursday. The Russian president’s comments on Wednesday about the oil-cuts deal are the strongest signal yet that the Kremlin is willing to redouble efforts to raise global energy prices. OPEC Secretary-General Mohammad Barkindo called them a “very strong endorsement” of the accord. Russia’s cooperation with OPEC has “breathed life” back into the organization, Saudi Arabia’s Energy Minister Khalid al-Falih said in Moscow. The kingdom’s plan for an initial public offering of state-owned Saudi Aramco is on track for the second half of next year, Al-Falih said.